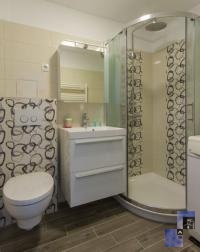 This modern apartment with elegant furnishing is situated on the outskirts of the old town, on street Vozarski pot. It is located on the first floor of an older and well maintained building without an elevator access. To Preseren square and Three Bridges is less than one kilometre long walk along the river Ljubljanica. This one-bedroom apartment has a bedroom with a king size double bed (200 x 180 cm), the living room with comfortable sofa which falls down to a bed (120 x 210 cm), LCD TV, working corner, air-conditioning and a private balcony. From the living room the entrance leads into a modern equipped kitchen with dining area, glass-ceramic stove, oven, refrigerator with freezer, cooking utensils, cutlery and small household appliances. A bathroom has a shower, sink, toilet and washing machine. The apartment also offers a CATV, telephone, free wireless (Wi-Fi) internet access, iron with ironing board, hair dryer, bed linens and towels. 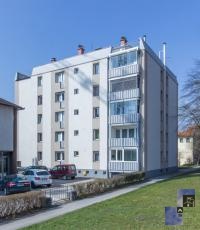 Parking is available in the vicinity of the apartment; some are free of charge (if available), otherwise there are also public parking lots which are payable per hour (Monday-Friday 7am-7pm, 0.50 EUR/ hour).